All the horses of revelation are important in Gods plan, but we need to be sure and know what white horse has Christ and which one has satan. The great deception is in satan loves to carbon copy himself to be like Christ. At his fall from grace he tried to be as Jesus who is known as the bright and morning star (Revelation 22:16) as we see in Isaiah when he calls himself the son of the morning. (Isaiah 14:12-17). 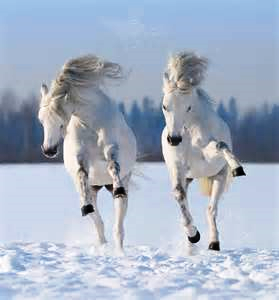 There are two white horses arriving and Jesus will have many crowns and satan only has one. Another difference is the heaven opens at Christs return, but not so with satan. When satan returns he has one bow and not a rod. (Revelation 6:1-2). The entrance Christ makes will be hard to miss as HE does not return alone, HE brings with HIM an army of saints arrayed in fine white linen and HIS eyes will be as a flame of fire! satans one bow will be no match for Christs sharp sword (Word of God) and rod of iron with a robe (vesture) which will read KING OF KINGS AND LORD OF LORDS. (Revelation 19:11-16). And I saw heaven opened, and behold a white horse; and he that sat upon him was called Faithful and True, and in righteousness he doth judge and make war. His eyes were as a flame of fire, and on his head were many crowns; and he had a name written, that no man knew, but he himself. And he was clothed with a vesture dipped in blood: and his name is called The Word of God.And the armies which were in heaven followed him upon white horses, clothed in fine linen, white and clean.And out of his mouth goeth a sharp sword, that with it he should smite the nations: and he shall rule them with a rod of iron: and he treadeth the winepress of the fierceness and wrath of Almighty God. And he hath on his vesture and on his thigh a name written, King Of Kings, And Lord Of Lords. The Rapture Theory and the left behind series is taking many out of Gods fold. The scripture of two will be in the field and one will be taken and the other left has people believing they are taken by Christ first and will return later with HIM (Matthew 24:40-42), but we see the answer given by CHRIST HIMSELF who comes first to be taken which is by satan as we read when Jesus was asked where are they taken Lord? HIS reply is where the eagles (vultures) are gathered together. We know these birds do not gather over the living but the dead. (Luke 17:34-37). I tell you, in that night there shall be two men in one bed; the one shall be taken, and the other shall be left. Two women shall be grinding together; the one shall be taken, and the other left. Two men shall be in the field; the one shall be taken, and the other left.And they answered and said unto him, Where, Lord? And he said unto them, Wheresoever the body is, thither will the eagles be gathered together. REMEMBER satan comes first at the sixth seal, sixth vial, and the sixth trump! 666 is his number and Jesus returns at the 7th seal, seventh vial and seventh trump!